Got a reactive dog? One who barks and lunges at innocent passers-by; grows fangs and a forked tail at the sight of another dog in the same parish; or maybe just melts with fear at the sound of a bicycle? I’ve been working with reactive dogs for years, and I have my own two Growlies too. So I know just what you’re up against. Fortunately more people are becoming aware of the issues, and that means slightly more people are beginning to understand that it’s not your fault! You’re not a terrible owner, and you haven’t got a horrible dog. He’s just not fitting in with the popular perception of what a pet should be. But, as you’ll know, your difficult dog is the perfect pet at home. You know how friendly, biddable, loving, and fun your dog is - once the fears that dance around her when out are removed. You know how to soothe her, how to play with her, how to stimulate her great brain so that she loves to do things for you. And it can be hard to remember, when you’re out and about and dealing with her demons, that at heart that’s what she is. She’s a dog. Maybe not the dog you expected when you took her on. Not the dog you’d be able to go on group walks with, not the dog to compete in agility with, not the PAT therapy dog you’d planned - visiting the old and the sick and charming them all. Get our free e-course to make instant changes in your growly dog! We can get so taken up with all the slightly different things we have to do with our troublesome pooch - like dodging into driveways, muzzle-training, learning sharp emergency turns, never being out without a supply of tasty treats - that we can overlook the basics. Building the bond with your dog is what it’s all about. I’ve noticed recently that a number of students in my plain vanilla dog training course (not geared for reactive dogs, in other words) are reporting - with surprise - that their dog is much less reactive when out, faster to settle, less likely to kick off at the dogs on tv. Working through the course lessons has turned them and their dog into a TEAM. The old acronym Together Everyone Achieves More, is never more clear than when you’re working with your dog - especially a challenging one! 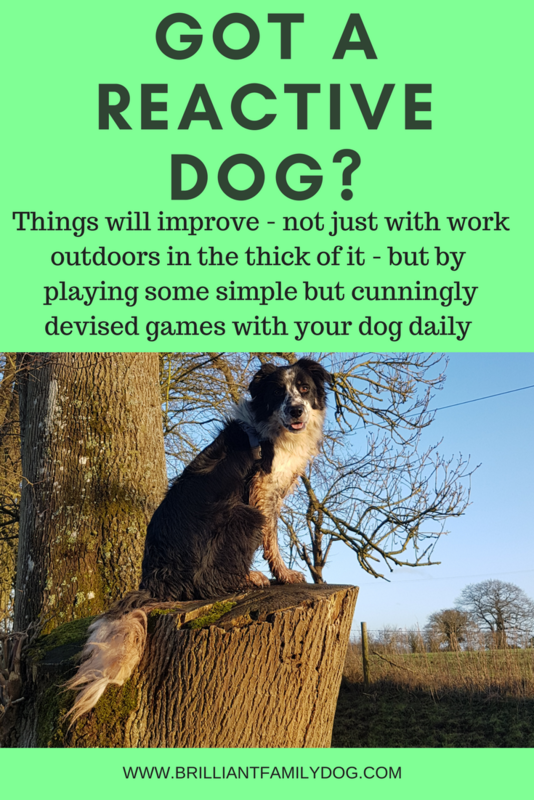 And it’s wonderful to see how things improve - not with lots of work outdoors in the thick of it - but by just playing some simple but cunningly devised games with your dog on a daily basis. You can see the change within the first few minutes of them being introduced to the game. “Suddenly,” thinks your dog, “this person understands me!” And you are left open-mouthed, wondering at the speed with which your dog has learned the new games, and how eager he is to play them anywhere, any place, any time. This is why, when I’m working individually with a reactive dog, I teach them these relationship-building games right at the start. Regardless of what happens outside, I want the dog and owner to get these under their belt straight away. And it’s a delight to see an owner change from trying to command their dog all the time, to allowing the dog to express his own opinion and make his own (good) decisions. Of course, the reactive dog owner does need strategies and techniques to improve their outside life, possibly opening up more possibilities in terms of where they can walk, and whether they can enjoy a cafe stop with their dog, like everybody else seems to be able to do. These learnings are vital to the success of the training. And I’ll be going into these in huge detail in my upcoming Growly Dog Course. It’s been tested out by the first group of students, and their suggestions and requests have changed the shape of the course so that it’s now everything they wanted. But none of this will work if the relationship is not there in the first place! It may be that you’ve been focussing so much on the trickier areas of your dog’s life that you’ve let slip this vital bond. I do understand how this can happen. You can try so hard to work on what’s going on outside - when a step back into harmony inside can have far-reaching results. She got that it’s about all the other stuff in your dog’s life with you - not just the apparently difficult parts. And if you want to know more about how specifically to help your growly, reactive, fearful, or aggressive dog, check out the new, updated Growly Course.